I was born April 4, 1890, at Brower. That’s up the hill from Corbett, over by the Columbia river gorge. There’s nothing left of the town now. I don’t even know if I could find it. My mother and father were cooks and worked at Brower. It was just a mill town, nobody else lived there except the people that worked at the mill. My brother Ed was born there too. Ed was a little bit older than me; he was born on December 31, 1887. My parents named me Violet Cecile Pine. (She pronounced Cecile as “see-sill”, equal emphasis on each syllable.) Ed was named Edward Zelotus Pine. He didn’t want to be called EZ Pine so when he was older he changed his middle initial to “A”. My father’s name was William Townsend Pine. He died about the time I was born. I don’t remember anything about him. Mother said he was born in New York. My mother’s maiden name was Louville Campbell. She married my father in Nebraska and then they came out to Oregon in a covered wagon. I still have their marriage certificate. It says they were married at the home of James H. Pine in Apple Creek, Holt County, Nebraska on December 22, 1882. James H. Pine was my Grandpa Pine; Mother used to tell us stories about him but I never met the man. 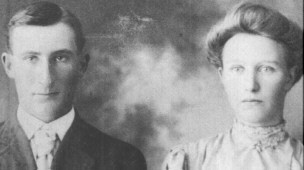 My mother’s parents, Jacob and Rachel Campbell, lived across the river at Brush Prairie, they had a place out there. They were very careful to pronounce their name as Camp Bell; they wouldn’t let anyone call them Cam’bell without hearing a correction. Aunt Amelia lived with them at home then as she wasn’t married. She ran away from home and married Alfred Woodward; he was one quarter Indian. Her parents wouldn’t talk to her for five years after that. Alfred had an interest in the sawmill at Brower so he lived on the Oregon side of the river. Aunt Amelia found someone to row her across the river and they got married. I used to stay with them quite often. When Ed was a baby Mother had a job cooking for some rich lady out on Sauvies Island. She was fixing dinner for a crowd of big shots the lady was expecting that evening. Ed was fussing so she gave him some cards to play with. When the lady saw the cards she grabbed them and threw them in the fire. “There’ll be no cards in my house”, she said. “There won’t be any cook either,” said mother. “I just quit.” She ripped off her apron and threw it on the floor for emphasis. “You can’t quit; who will do the cooking,” the lady asked. “You can do your own cooking,” Mother replied. “I’m leaving.” And she did. Mother was pretty feisty. In those days times were pretty tough for a widow woman with two babies. Mother moved in with her parents who by then had moved to St. Helens. Grandma Campbell ran a boarding house and fed crews that were working on the railroad. Mother helped her and worked wherever she could find someone that needed a cook. Old Charlie Mellinger carried the mail to and from Vernonia. His wife was sick so he hired mother to come in and take care of his wife and do the cooking. I think she died, too. Anyway, Mother loaded Ed and me on a horse; she made saddle bags for us to ride in, one baby on each side of the horse. She led the horse and walked from St. Helens to the Mellinger place on Rock Creek to work for Mr. Mellinger. The Mellinger house was close to Rock Creek and that spring there was a big flood. The flood water trapped some pigs under the house. Mother could hear the pigs squealing and bumping around under the floor. She couldn’t bear the thought of those poor pigs drowning under there. The men were out working somewhere so she got an axe, chopped a hole in the floor and rescued the pigs. Mr. Mellinger was angry about the hole in the floor. They had words so Mother quit. She put Ed and me in the saddle bags on the horse and walked back to St. Helens. Mother’s youngest sister Gertie (Gertrude Elauna Campbell) married a salmon fisherman by the the name of Stamp (Philip Sagar Stamp) at Grandma’s house (June 4, 1892). They lived at Washougal for a while. Mother was the midwife for their first child, Alice May Stamp, born March 18, 1895. The Stamp’s moved over by Estacada. We used to visit them there. Mother married her cousin, William Davis, and had two children by him: Wilma and Elmer. Wilma was the oldest, she was born Jan 23, 1897. Elmer was born December 18, 1899. William Davis had gold fever so we moved to Jacksonville; I remember going to a parade when we lived there. The Spanish-American War was going on and the soldiers were leaving; they had a parade. I can remember trying to hide my feet because I didn’t have any shoes to wear. My brother Ed thought I was being funny because none of the kids were wearing shoes. William Davis left us in Jacksonville while he went to Alaska, looking for gold, and he never came back. We heard he drowned while trying to cross a river. We went back to St. Helens to live with Grandma and Grandpa Campbell. Mother went to Latourell to work in the hotel as a cook for “Uncle” Joe Latourell. He wasn’t our uncle, everyone called him “Uncle Joe”. Actually he was a “shirt-tail” relative. John Woodward, the father of Aunt Amelia’s husband, married Sarah Ough and Joe married her sister, Clara. Joe was an uncle to Alfred and Alfred was my uncle, anyway, we called him Uncle Joe and so did everyone else. I used to play with the Latourell children. The twins lived with their Grandma; their mother died I guess. Mother told us to play close to the house. She warned us about the animals that came down off the hill behind their house but we didn’t mind her. We thought she was just trying to scare us into staying close to the house. One day while we were playing hide and seek I heard a noise behind me and looked around to see a big cougar coming toward me. I got out of there faster than lightning. That cougar darn near got me. We played closer to the house after that. Mother met old George Walther when she was working at Latourell. One day she was going up the hill to visit with Aunt Amelia. There were some abandoned cabins on the creek below Latourell Falls. As she walked by the cabins she noticed smoke coming from the chimney of one of the cabins. She thought maybe some kids were playing in there so she went to see what was going on. She found old George Walther and another fellow living in the cabin. They had skipped a ship down the river and took up residence in the empty cabin. Old George.. his name was Gys Bertus, people called him George.. followed us to St. Helens where he and Mother got married August 6, 1901. He was just a worthless sailor. He was too lazy to work. Mother wasn’t particular; she would marry any crooked stick that was walking down the road. She had two children by Old George. Bert Walthers and Roy; Roy was Frederick LeRoy Walther but we called him Roy. Bert was named Gys Bertus Walthers Jr. I got a job working for the Duponts at Valley. They had a daughter that would have been my age if she had lived. She died of typhoid fever. I guess we looked enough alike to have been twins. They wanted to adopt me. They had a piano; maybe I could have learned to play the piano. Mother brought me back to St. Helens to help Grandma Campbell. Grandma’s mother, my great grandmother, was Mary Root. Her husband was Zelotus Root, the man that Ed got his middle name from. She had come to live with Grandma Campbell and was sick in bed. I just called her Grandma Root even though she was my great grandmother;everyone did. Grandma and Grandpa Root lived over by Tillamook. They had lived there since 1870. They came down from Canada. After Grandpa Root died Grandma Root got lonesome for her family. She decided to go live with her daughter Rachel so she walked the Indian trail to Seaside and then followed the railroad to St. Helens where her daughter lived. She said at night she would lay down next to a log to sleep. One night a big old bear came by and sniffed her. She said she smelled so bad the bear ran away. Mother heard about some homestead land on the Lewis river up behind Woodland so the bunch of us went over there. Bozarth.. one of the Bozarth boys told us we could homestead up on Speelyai Creek. Our place was up on the bench above the Lewis River. Joe Polly was our neighbor; later on they moved to Woodland and ran a restaurant. Ed got a job working for old man Peterson, working at his shingle mill. Ed said it was so cold up there that when the bib on his overalls would get wet it would freeze solid. When he tried to bend over the frozen bib would chuck him under the chin. He quit working at the mill when he got enough shingles for a cabin and a barn. One day Ed saw a deer on the hill behind the cabin so he borrowed a gun from Joe Polly and shot the deer. Ed came to the house to get a knife to dress the deer. When we got back to where he killed the deer it was gone. A cougar had grabbed the carcass and ran off with it. Ed and I went to school up there. Their school house burned in the big fire (probably the Yacolt burn of 1902) and they held school in a tent. We had a burro that we rode to school. It was two and a half miles each way. Ed and I caught a lot of salmon in Speelyai creek. Ed took an old pitchfork and made a spear out of it. He would stand on the bank and when a salmon went by he would spear it. He never missed a fish. Mother got sick and we had to bring her out. She would have died up there. She was in a family way but none of us knew about it. That was just before Roy was born [Frederick Leroy Walthers, April 7, 1904]. It turned out our place was on school land and we couldn’t claim it. We worked like trojans clearing that land and building those buildings. We did it all for nothing. I made friends with an old Indian woman in St. Helens. Everyone called her Indian Isabel. She was real old; she could remember Dr. McLaughlin and the Hudson Bay trading post at Vancouver. Everyone liked her. Her husband was real mean to her and beat her up. After that he disappeared. The people in town built her a nice house to live in. I spent a lot of time with her. She wanted to adopt me. Grandpa Campbell was a boot and shoe maker. That was his profession. He had a shop out back of Grandma’s house. He would cuss the air blue if something didn’t go right. Sometimes Mother would go out to the shop and argue with him. He called Grandma that “damn woman”. Grandma said he slept with a pistol under his pillow. I was afraid he might shoot her with it but she said it was missing some parts and wouldn’t shoot anyway. “But Grandma,” I said, “he might hit you with it.” She wasn’t afraid of him. Grandpa would talk about moving back to Nebraska and Grandma would say, “You go right along, I’m going to stay here.” The house was Grandma’s house, she bought it and paid for it with money she made cooking meals for the railroad crews. I worked for a lady named Margaret Nelson up at Scappoose. Her husband was John Nelson, a fisherman on the river. She ran the farm and he fished. She was a daughter of Elizabeth Downing who was a sister to Grandma Campbell. Margaret never rinsed her fruit jars when she emptied them. When it came time to can fruit we had to wash all those jars. We had to soak those jars in a tub of water for a week just so we could get them clean. I helped her do the canning. Grandma’s sister, Elizabeth [Root], married a fellow back East by the name of Davis and when they were coming out west he died in Utah. The Mormons were going to make her marry a Mormon. Her folks made her a bed under the wagon and she and her son William Davis, who was little at the time, hid in there. They drove two or three days like that until they got out of Utah. They did that so the Mormons wouldn’t find her. She married John Downing after that. That was the same William Davis that Mother married after my father died. He was her cousin. Mother’s brother Walter (Walter Townsend Campbell) married a red headed woman by the name of Bessie (Bessie Fowler Stone; April 28, 1906.) They got married at Grandma’s house in Houlton. She had a temper and would faint if anything went wrong or she didn’t get her way. The kids all called her “Red Bess”. Mother started yearning for the open prairies of Nebraska. After a while the trees began closing in on her. She complained she couldn’t see far enough. She complained about the weather. She said it was too wet; it wasn’t healthy to be wet all the time. She just had to go back to Nebraska and dry out. She had a Prairie Schooner wagon built, bought a team of horses and had it all loaded aboard a sternwheeler headed for The Dalles. She was going back to Nebraska. She was going to reverse the Oregon trail. I was staying with Aunt Amelia at Corbett when the time came to leave. Corbett wasn’t a regular stop for the sternwheeler but Mother talked the Captain into stopping long enough to pick me up. Mother could say more in a minute than most people could think about in a week. I imagine the Captain gave in rather than listen to her yammer all the way up the river. He gave a long blast on the whistle as a signal so I knew when to run down the hill to the river. They put down the gangplank and I climbed aboard. We crossed the Deschutes on the free bridge. We went up the river and crossed on the free bridge. The hill up to Wasco was too steep for the horses. They couldn’t pull the wagon up that hill. Ed walked up to the top. There was a fellow that lived up there, he had teams of horses and would help people pull wagons up the hill. Ed worked for him to pay for the pull up the hill. While Ed worked out the cost of moving the wagon we all went on over to Wasco. I got a job working for the McMillans. She was sick and I did the housework and took care of her kids. Mother was sick too so most of the money I made went to buy medicine for her. Every night we had to wrap the wagon wheels in cloth and wet the cloth with water or else the felloes would dry and shrink; if that happened the wheel would fall apart. That was one of the chores we had. We gathered wood for the fire. The wagon had barrels on each side for water and we had to keep those barrels full. We wore regular clothes, everyday type clothes. The road was too rough to ride in the wagon. Mostly we walked. The kids could play and keep up with the wagon. Mother drove the wagon and old George rode with her but the rest of us walked. We found an old ghost town, some of the houses looked like people just got up from dinner and disappeared. Plates were still on the table and the furniture was still there. Maybe they planned to come back. We were up by Butter Creek. The wagon had already crossed the creek but the rest of us were on this side still when a flash flood came roaring down the creek. Mother yelled at us to stay put but our dog tried to cross. He was swept away by the water and we never saw him again. After a couple of hours we could cross the creek and join up with the wagon. If we found work we would stay while work was available. I worked at Wasco. We stayed at Echo for a while. We heard there was work at Walla Walla; they were working on the water works. So we went up there. Mother got a job cooking at the camp and George found me a job in town. I was taking care of two little boys and a baby that was three or four months old for a lady who was in the hospital. The husband asked me, “Now, did I know anything about babies?” I told him, “No, I didn’t know anything about babies. I had just been taking care of them all my life.” Every place I worked I had to take care of the baby. I took care of Mother’s babies and I took care of the babies for those people. He decided he would take care of the baby at night. He put the baby in a rocking chair in his room. I slept in the other room where the 2 little boys were and then his brother-in-law slept in the front room. And at night that baby would cry and cry and cry. He would never hear it. So I got up one night, I slipped in there and I pulled the rocking chair into my bedroom just as quiet as could be and locked the door. I gave the baby his bottle, that’s all he needed was his bottle. When the father woke up he didn’t know where the baby was. When he found out that I took it, boy, he was mad. He said, “You didn’t ask my permission.” I told him, “you were dead drunk, how was I going to ask you anything?” He was.. he was drunk, and the baby was just crying its eyes out. I said, “I know more about taking care of that baby than you do. You can leave the baby in my room or I will report you to the authorities.” He never said anything more about it. The camp shut down because of snow. They couldn’t work any more because of the snow so they shut down the camp. The people that ran the camp told us we could stay if we wanted to; we didn’t need to move out. We had our own tent so we moved up just above the big cook tent. All the left over food.. all that stuff was just sitting there, going to spoil.. they said we might as well use it up. It helped us a lot anyhow. I met Oscar at Walla Walla. He and his brother, Otto, were living at the camp. When the camp closed they went down to Munsel’s to work. Oscar didn’t want to live down there so he stayed at the camp. One night when there was snow on the ground we heard a commotion outside the tent. Someone said, “It’s probably that Dutchman again.” I told them to watch out how they talked about him. He might become their son in law. It was Oscar, he had fallen down in the snow. We discovered we could homestead forty acres down by Nolan. Mother decided the area around Nolan looked like Nebraska so we went to Nolan and settled in. We dug into a bank to make a room we used as a kitchen. Our dugout was as big as an ordinary room. We turned the wagon upside down to make the roof. We had a tent to sleep in. I worked for a guy down there by Nolan, they lived on the breaks of the Umatilla river, milking cows, chased the cattle in at night and milked the cows for 3 quarts of milk a day. This old man and his wife… he couldn’t chase the cows in and that’s the way they made their living, you know, off of extra money they made from butter and milk. They had more stock that they could handle. I worked there and did that until I got sick and tired of it. Quit it. I went down and got a job in town, working for a woman in town. I can’t remember their names. They lived down in Nolan. One day Oscar came down from the camp at Walla Walla. When we went to Nolan we left him behind of course. He hopped a freight and came down. He never paid any money to ride. He rode the freight. Oscar and Ed put up another tent; they slept in the other tent. So we went to work clearing land. Mother went to Pendleton to file a claim on the land. Soshure, a big sheep man, found out what we were going to do so he sent one of his hired hands to Pendleton to file a claim. His claim was dated one day before mother’s so she lost out on her homestead. After we did all that work we didn’t have a thing to show for it. I worked in Nolan for awhile but it wasn’t paying enough, so I quit. We went down to another place to work, the bunch of us did. Finally we got down to the Dalles, right down to the Dalles. When we came down the hill into The Dalles the wagon wheel came off the wagon. Crazy thing rolled right down the hill into the camp grounds. Mother said we might as well go back to St. Helens, so we went back, we all went back. When Mother saw the trees again she cried. When we got back to St. Helens we found out that a lawyer had been out from New York looking for descendants of a Pine that died back there. In a fit of spite Aunt Bess told him there were no descendants living. We would have inherited $25,000 if she had told the truth. Mother had all our documents in a trunk in the attic. Bess destroyed our papers so we couldn’t prove a thing. Oscar and I got married in St. Helens. His parents (Otto and Matilda Zimmerman) came up from Albany on the train to be at the wedding. Aunt Gertie (Stamp) made my wedding dress. Alice Stamp, Gertie’s daughter, and Arthur, Oscar’s little brother, stood up with us. We got married in the front room of Grandma Campbell’s house in Houlton. Married: At the residence of J. Campbell in Houlton, on Thursday, August 8th, at 10:00 a.m. Oscar Zimmerman of Albany, to Violet Pine, of Houlton, Rev. Davies officiating, Mr. and Mrs. Zimmerman took the afternoon train for Albany.